You could knit it for me! 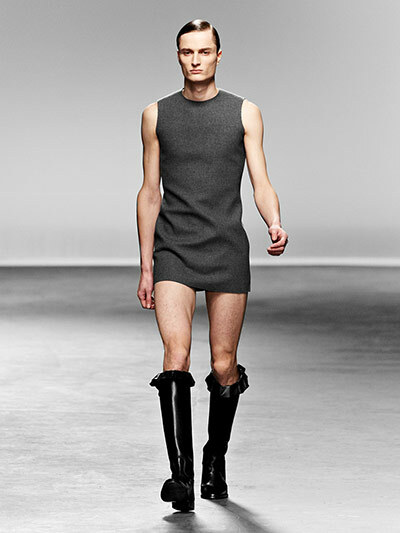 The above look, from J. W. Anderson’s “Mathematics of Love” collection is described by the Guardian as “an exercise in gender bending”. Unfortunately, neither Doug nor Leah were overly enthused by this number, by Agi and Sam, either. 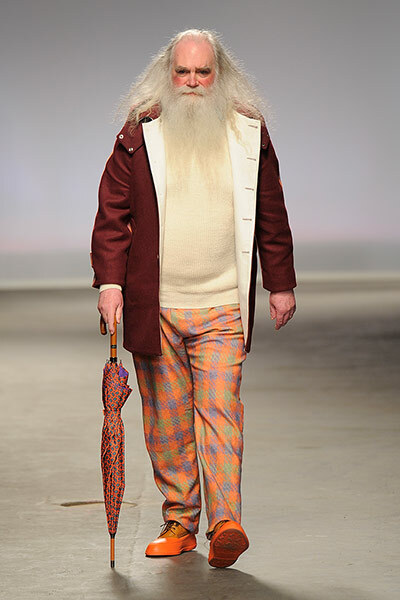 This entry was posted in Main and tagged Fashion, Knitting, London men's fashion week by knitigatingcircumstances. Bookmark the permalink. 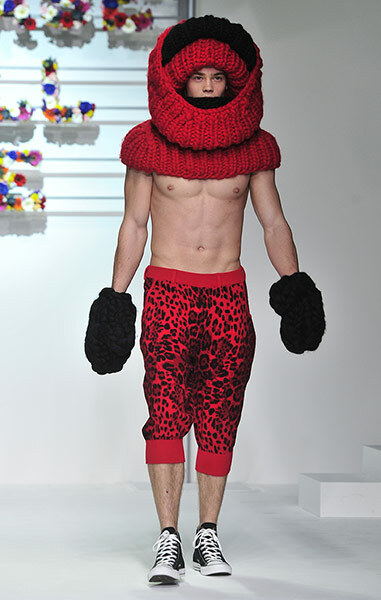 Looking forward to seeing a future post here with Doug modeling this after you knit it up. I would put aside any projects you might be working on and start knitting this. And of course you need to take the pictures of him trying it on for sizing every few inches you knit. Doug- you’re a good sport. I can hear you all laughing! Can you hear me? Hi, Teresa. I knew you’d like this one! Hahahaha, I’d like to watch red-cowl-boy with those oh-so-practical roving mitts (CO 8 sts, k 10 rounds, bind off) fumble with the lock on our wood shed at -30C windchill dressed like that. The poor thing would die of exposure. At least we’d be able to locate his frozen body in a get-up like that LOL! Unfathomable, fashion like that. I’m all for avant-garde, but really…it’s pushing the limit a bit too much for my taste. Let’s swing the pendulum back a bit.